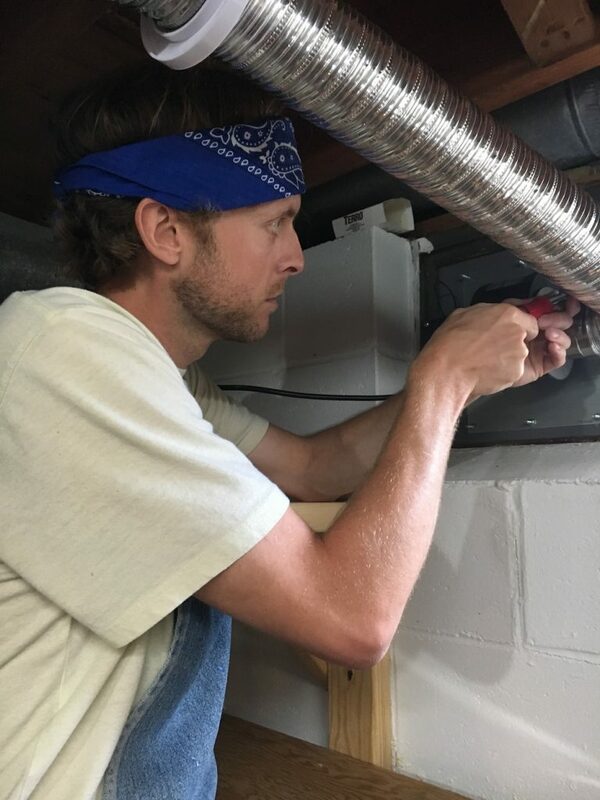 Brett Beasley installs a new ventilation system in his ceramics studio. From dust collection systems to fire extinguishers, twenty artists from across the country received grants to help safeguard their studios, protect their careers and implement safety measures. Metalsmiths Amarette Gregor from Portland, Oregon and Missy Graff Ballone from West Orange, New Jersey received a grant to purchase fire extinguishers, hazardous material cabinets and ventilation systems to ensure safe working environments in their home studios. Furniture maker John Leko of Huntsville, Alabama and jeweler April Hale from Stevensville, Montana were each awarded a grant to begin their estate and legacy planning. Allied Woodshop, a furniture making collective in Los Angeles, California, received a grant to implement health and safety measures. Funds to install a much needed up-to-date security system were awarded to Associated Louisiana Artists (ALA) Gallery By the Lake, in Lake Charles, Louisiana. As part of the grant, artists will share what they’ve learned through videos, blogs, workshops and social media to inspire other artists to “Get Ready.” Sarah Evenson, a paper artist from Minneapolis, Minnesota will safeguard her artwork by purchasing a flat file and a backup hard drive. She will engage other artists by creating a “Safety Saturday” hashtag on Instagram, providing updates and answering questions, offering suggestions, and discussing other artists’ safety plans. Brett Beasley, a ceramicist in Ames, Iowa, will produce a blog, “Right From The Start,” to connect with other studio artists and discuss studio safeguards and recommendations for ensuring a lifelong pursuit in the arts. Find out when the next “Get Ready” Grant deadline is here.